Winter is well and truly upon us now, and as expected growth in the vegetable patch has slowed down, I wish I could say the same for the weeds. It's hard enough to keep on top of the weeds during the colder months, but when you add the flu (which took me two weeks to get over) to the mix, by the time I felt well enough to go down to patch it was completely overgrown. It took about six hours to get it all done, now I just have to keep on top of it. The snow peas that I sowed on May 14th finally sprouted 15 days later. I am using two old innersprings that I picked for free as trellises for them, when the peas are a bit bigger I will take a photo, I like the way they look in the garden, kind of like rustic sculptures. Even though they were covered, my first planting of mini cauliflowers was decimated by aphids, so they had to be pulled out and they were replaced with Snowball. Two of the Green Dragon broccoli plants were also affected but nowhere near as bad as the caulis and with a spray of soapy water I was able to save them. You can see the aphid damaged brocolli on the right. I also planted a punnet of Green Sprouting broccoli, and I will be planting another punnet in two weeks time, hopefully that will give me enough broccoli to see me through until summer. The garlic is coming on, I'm hoping I've got the number of cloves right this year. Last year I planted way too many and most of it went to waste. I've lost count of how many times I've sown coriander seeds, but none of it germinated and in the end I gave up and resigned myself to not having any this season, so I was pleased last week to find a single plant that had self-germinated. Maybe I'll have coriander after all. After I finished weeding the strawberry bed I discovered the Red Gauntlets flowering. The last of the Genovese and Thai basil were harvested, half of which was frozen, the other half is hanging in the kitchen window to dry, along with two bunches of parsley. I've also been harvesting small amounts of bok choi and silverbeet. I have sown more snow peas, both Melting Mammoth and a new one I am trying, Oregon, Sugarsnap, Telephone, Early Crop Massey and Blue Bantam peas. Windsor Longpod and Brown Beauty beans have also been sown and I am hoping to have a bumper crop of beans this year. Plant the potatoes, more bok choi, broccoli and celery. Keep on top of the weeds. That's about it for this month's update, I will see you all again next month with another. I seem to have developed a bit of an obsession with crochet rugs. It all started when I decided to make one for my bed, it took two winters to finish, and when it was all done, I didn't like it. So, I undid it, added more cream into the mix, sewed it all together and, still didn't like it. Fortunately, my daughter loved it and it now helps to keep her warm during our cold (to us) winters. Nosegay squares by Priscilla Hewitt, the pattern can be found here. After getting over the disappointment of doing all that work and still not having a rug for my own bed, I decided to try again. Knowing how time consuming crocheting all those squares and then putting them all together was I decided this time to try something a little different, a ripple afghan. By the end of spring I had finished 3/4 of it when I ran out of yarn, so it was put it away until the following winter. As soon as the weather started to cool down again, I bought more yarn only to discover that it was completely different in colour and texture to the previous year's yarn. Lesson learnt, always make sure you buy enough yarn for your project (maybe even a little extra) and make sure that it's all the same dye lot. So, putting yet another disappointment behind me, I decided if I couldn't have a rug for my bed, I would make one for my youngest son who had recently moved to Victoria. I am happy to say that there were no problems with this one, and he loved it. Last winter I started an afghan for our lounge room and didn't think that I would get it completed in time for this winter, but with the unusually cool summer we had, it was finished by summer's end. The pattern is "Greenway" by Donna Yacino, and can be found here. The pattern for the border can be found here, it's a bit wonky, but I can live with that. At the moment I am working on a second afghan for the lounge room, a ribbed ripple reversible afghan, this is also a free pattern and can be found here. I was about a third of the way through when I spotted a mistake. Honestly, I don't know how I didn't see it sooner it was so obvious. I had started line seven with cream yarn (the correct colour) but when I had to add in more yarn for some reason I changed to white, so of course I had to rip it apart and start again. It's coming along slowly at the moment as I am still trying to shake off the flu, hopefully I will get it finished in the next few weeks, as I would really liked to get started on rug for myself. 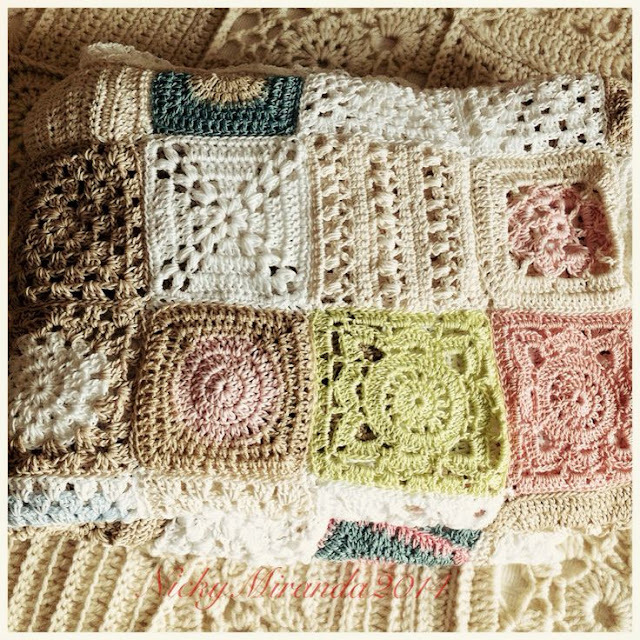 I have looked at dozens of different patterns over the last few weeks trying to decide which one to make but none of them ever looked "right" until I spotted this sampler blanket on Pinterest and was instantly smitten. It reminds me of a quilt. There is just one problem with it though, all those squares. Clearly I am a glutton for punishment. I already have all the wool, similar in colour to the ones used here, bought when Spotlight was having a 40% off sale, I can't wait to get started.